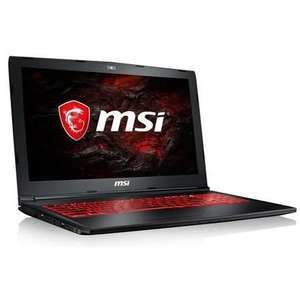 Been looking for a gaming laptop for ages Found this one at Laptops Direct - not seen this particular one this cheap, seems like a good deal, although the GPU is only 3gb. Yeah, 3GB VM 1060 and by the looks of it only a 256gb SSD, with no HDD. Have a look at the laptops deals at Scan, son-in law just got an I7 1050 TI 4g Asus gaming PC with extra bit for £799. Also it has both a 256g ssd and a 1TB hdd plus 8g of ram. Have a look at the laptops deals at Scan, son-in law just got an I7 1050 …Have a look at the laptops deals at Scan, son-in law just got an I7 1050 TI 4g Asus gaming PC with extra bit for £799.Also it has both a 256g ssd and a 1TB hdd plus 8g of ram. More to factor in than just which card it comes with. Prefer the build of the MSI ones personally. The 1060 3gb is infinitely better than the 1050 ti, they arent even close to the same performance. More to factor in than just which card it comes with.Prefer the build of …More to factor in than just which card it comes with.Prefer the build of the MSI ones personally. Partly but the card is the only thing you can’t upgrade later on and are stuck with. Now it is today yes, snooze you lose and all that but it wasn't when I replied above. I guess the days of "cheap" 1060's is drawing to an end as 7th gen stock gets cleared out. Can anyone recommend a 1070 laptop? A lot more going on than just the GPU. For one thing, if you're gaming then go for an i7 if you want a chance at keeping up with most modern games a few years from now. Get something that feels right in the hand, too. MSI (or at least the upgrade of the one in OP) suits me but a lot of people harp on about the build quality of recent Alienwares like the 13 (plus that OLED display makes all the difference). Tempted to go for this. Anyone know any better deals around? Would like it for 3d cad and some gaming. Deal posting newbie! This is bigreddan first deal post. Help out by leaving a posting tip or just to show your appreciation for their contribution.